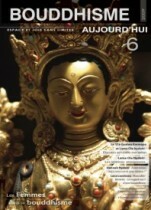 Bouddhisme aujourd’hui is an annual review published by French-speaking Diamond Way Buddhist centers founded by Lama Ole Nydahl. It aims at offering Buddhists teachings for Westerners who wish to work with mind in order to discover its real nature. 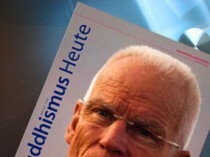 In this review, you will find articles and interviews from Diamond Way masters, lamas and travel teachers, pictures and informations about Buddhist events taking place worldwide. The texts in this magazine being timeless, every issue is unique and you may consult it any time you feel like it. It not only aims at providing information but also at helping you apply the Diamond Way view in everyday life. Buddhism Today aims to be a living document of authentic Buddhist transmission for the lay person and yogi practitioner in the West. It is meant for people leading normal, active lives, who wish to understand and experience mind’s vast potential. 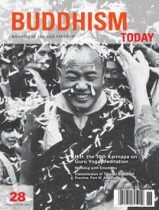 Buddhism Today will challenge your mind by providing information and news that appeal to the discriminating individual. No religious truth can be above science or humanism, and Buddhism Today‘s aim is to work with and to complement these areas of contemporary thought. For this reason, Buddhism appeals to educated, critically thinking people with fresh, independent minds — people for whom nihilism rings hollow and existentialism provides no joy. It is said that we live in “interesting times.” To some these words reflect the degenerative nature of the modern world in which we live. But to us, these words are a call to action and a statement of renewal, an opportunity for seeing new possibilities and openings. In either case, we promise to expound joy and humanism above political correctness or dogmatic assumptions.